The close association, down the ages, between horse, hound and man makes remarkable reading. All over the world, throughout recorded history, mounted hunters and hunting dogs have worked together in remarkable harmony. There always seems to have been a special affinity between hounds and horses. Neither seems to have any preoccupation with themselves, quite unlike man. Both the horse and the dog are more interested in external stimuli rather than self-interested introspection. This makes both of them loyal and selfless, ideal companions for each other and valuable servants to, and sometimes victims of, man. Breeds like the Dalmatian and the harlequin Great Dane have been traditionally used as carriage dogs, lending a distinct elegance to coach travel, as well as having the functional value of keeping village curs from alarming the horses. 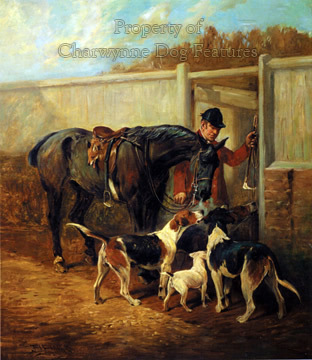 Bull Terriers and small mastiffs were often used to guard valuable horses in stables. Rat-catching breeds like the Manchester Terrier were widely used to keep vermin down in stables. 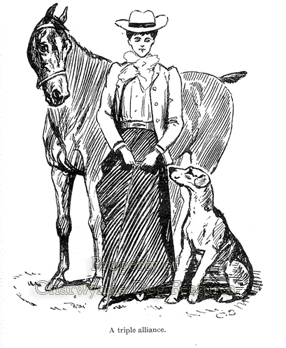 As a direct result of such an association is the fondness for horses which many breeds of dog retain to this day. 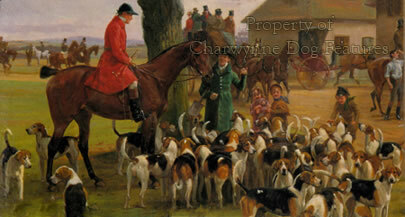 But the classic sporting trinity is that of man, horse and hound. Many artists have captured this relationship very skilfully. The history of Man the livestock farmer too would have been so different without dog and in many places, without horse. Down the centuries, man the hunter has needed the mobility of the horse and the catching and killing ability of the hound. Xenophon described three varieties of the Cretan hound: the Cnossians, famous as trackers; the Workers, so keen they hunted by day and night, and the Outrunners, which ran free under the huntsman's voice control only. According to Aristotle, the latter variety ran instinctively beside the horses during a hunt, never preceding them and not lagging behind. Unlike many of the other hounds used by the Greeks in the chase, the Outrunners were neither dewlapped nor flewed. They were used by the Cretans to hunt a four-horned antelope, as Aelian has recorded. These Outrunners were too valuable for use on boar hunts, where some hounds were killed. They were considered too special for use in hare hunting. Suffiently biddable to be used as 'braches' or free-running hounds, as opposed to 'lymmers' or leashed hounds, they hunted using sight and scent, rather as our own fleethounds used to. In this way, the Cretans' use of horse and hound was exceptional and showed the advanced state of their training and breeding skills. In any hunt involving hounds and horses, the latter have to show consideration for the former or injuries would be frequent. In The Lonsdale Library’s Fox-Hunting, Lt Col Brooke writes: “The main advantage of such a trial (i.e. 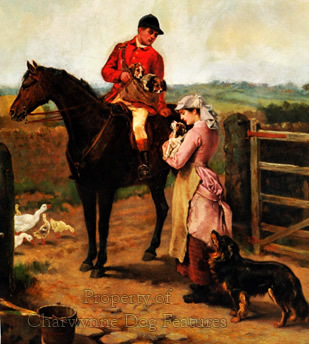 in the hunting field, DH) is, that in addition to trying your mount over fences, you can ascertain whether he is temperate with hounds, an important item from the point of view of enjoyment…one must take into consideration the fact that every horse is keener with hounds and is much more easily controlled when ridden in a field than he would be in a hunt…Remember that we depend upon the hounds to give us our sport. The modern child understands the necessity of tuning a wireless to the correct wavelength. 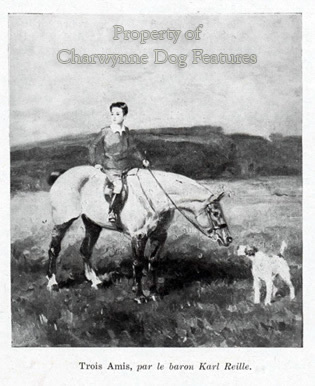 It is somewhat a similar problem with hounds, but in their case, it is the question of ‘nose’, the receiver and ‘scent’ the wave-length.” It is quite remarkable that, in the excitement of the chase, horse and hound manage to run together with such ease: horse, hound and human rider in harmony. A hunter is around 67" at the withers, a Foxhound only 25"; the all-round vision of a galloping horse is not limitless yet accidents in which hooves damage hounds are almost unheard of. Just as the hound is a pack animal, so the horse is a herd animal. Each has an instinctive awareness of the other. 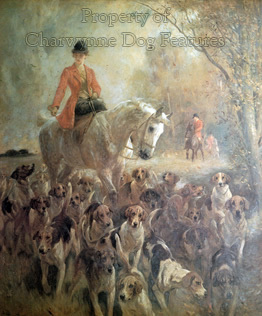 In the hunting field, down many centuries, horse and hound have run together in mutual support and remarkable empathy. In such an activity, horse and hound need speed, stamina, drive and spirit, with the hound also needing nose, cry, pack sense and discipline in a group. Both need sound feet; the old hunting man's expression "No hoof, no horse" has relevance for hounds too. Both need hard exercise, the right nutrition and good breeding. 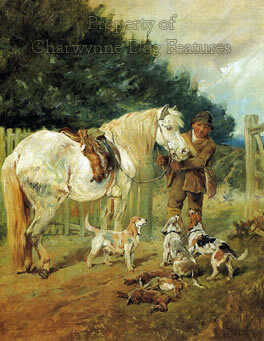 In his valuable book Hunting of 1900 from the Haddon Hall Library, Otho Paget wrote almost a summary of such needs: "A few seconds' respite on the turnip-ground gave your horse an opportunity of getting his second wind, and he now seems as fresh as ever, but you feel very thankful that most of his forebears are recorded in the stud-book...Hounds are driving along now at a tremendous pace over the old turf, and there is not a sign of one tailing off. You are delighted with the result of your kennel management, with summer conditioning and autumn education. This is the moment when you reap the fruits of all your care and labour. In spite of the severity of the pace, neither old nor young show the slightest symptoms of flagging." Breeders of hunters in the last century usually went for the thoroughbred horse on the half-bred mare. But some favoured the reverse, going for size and strength in the sire and quality and stamina in the dam. Some of the best hunters one hundred years ago were by half-bred stallions out of thoroughbred mares. Clearly, performance ruled with the horse then just as it did with the hound. In his Hounds of Britain of 1973, Jack Ivester Lloyd wrote that "...genuine hunting folk have displayed considerable elasticity of mind by introducing out-crosses when these would benefit the breed in which their interests repose. This is the reason that all hounds now hunting in Britain possess stamina, health and intelligence, virtues which could not be claimed for all the canine breeds kept as pets or for display on the show bench." 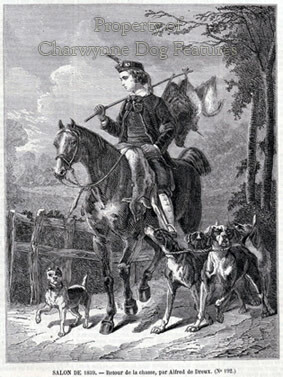 "The domestic dog", says Cuvier, "is the most complete, the most singular, and the most useful conquest that man has gained in the animal world...The swiftness, the strength, the sharp scent of the dog, have rendered him a powerful ally to man against the lower tribes; and were, perhaps, necessary for the establishment of the dominion of mankind over the whole animal creation. The dog is the only animal which has followed man over the whole earth". These comments strangely overlook the value of horse to man and ignore the remarkable contribution of horse and dog together, not just to man's hunting and sporting activities, but to exploration and farming across many centuries. Dog and horse have literally accompanied man "over the whole earth", with dog having the size advantage when it comes to sharing the hearth. Without the horse as a means of transport and the dog as hound and herder the whole story of human development would have taken a very different course.